Hi, all. It's time again for In My Mailbox, a weekly glimpse into the content of my mailbox (only the fun things like books, of course!). Kristi of The Story Siren hosts the roundup, so head on over there to see which books you might want to put on your radar! Bitter Melon by Cara Chow (Egmont USA, December 2010). This is a 2010 debut and I know it's written by an author of color (and featuring an Asian-American protagonist), so I'm excited to read it! Edges by Lena Roy (Farrar, Straus, & Giroux, December 2010). This is a 2010 debut! The False Princess by Eilis O'Neal (Egmont USA, January 2011). This is a 2011 debut and there's a story behind why I requested this one. The very first year I won NaNoWriMo, my story was about a girl who was secretly adopted at birth and raised as a princess. Neither the girl nor the kingdom at large knew that the queen wasn't her biological mother. When I read the blurb for this one, it sounded kind of similar (by coincidence, only!). Obviously I'm intrigued by the idea and I had to see what a real writer would do with it! 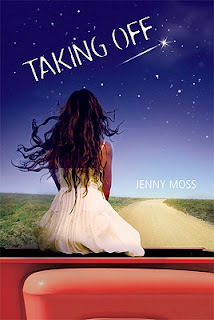 Taking Off by Jenny Moss (Walker, January 2011). Historical fiction set around the Challenger space shuttle explosion. I actually just finished this one, so except a review soon! And that's it for my mailbox! I have been so busy lately that I feel like I haven't had any time to read... Luckily I've got a vacation coming up after Christmas, so I plan to do nothing but read, read, read!